The Caretaker4 App now cleared to run on ‘off the shelf’ mobile devices and tablets, adding a number of additional monitoring controls including visual and audible patient alarms, data encryption, secure data forwarding, and remote software updates. The Caretaker4 Remote Monitoring App is now cleared to receive and display data from other 3rd party FDA Cleared medical devices. The Caretaker Software Library allows development partners to integrate Caretaker4’s wireless CNIBP and Vital Signs into their patient monitoring platforms, providing uninterrupted streaming of Continuous Non-Invasive Blood Pressure (“CNIBP”) and Vital Signs using a disposable Finger Cuff. Established as one of the lowest cost, clinically validated Continuous “Beat by Beat” non-invasive Blood Pressure monitors available, the new FDA clearance extends Caretaker4’s multi-parameter functions to include Continuous Non-Invasive Blood Pressure (SYS, DIA, MAP), Arterial Pressure Waveforms, Heart Rate, Respiration Rate, SpO2, and body temperature monitoring wirelessly, from virtually anywhere. Caretaker customers and OEM Partners now have multiple options for secure remote monitoring and wireless data integration with multi-vendor monitoring platforms and electronic medical records systems. Caretaker Medical is working with strategic partners and global distributors to expand the Caretaker4’s reach into critical care and hospital settings as well as mid-acuity outpatient clinics. “This new FDA clearance demonstrates our commitment to advancing non-invasive, uninterrupted remote monitoring of Continuous Blood Pressure and Vital Signs throughout the full continuum of care, without tethering patients to poles or equipment carts or using invasive Arterial Catheters”, said Jeff Pompeo, President and CEO of Caretaker Medical. “Continuous patient monitoring has been historically reserved for the ICU or Telemetry ward using bulky wires and equipment, but Caretaker is bringing ICU quality, affordable, non-invasive, wireless Beat-by-Beat monitoring to all points of care to improve outcomes and streamline workflow. Instead of relying on intermittent ‘spot-checks’ with cumbersome BP Arm Cuffs, the Caretaker4 provides clinicians with a continuous “beat by beat” view of a patients hemodynamic health so they can make better treatment decisions and improve quality of care”. 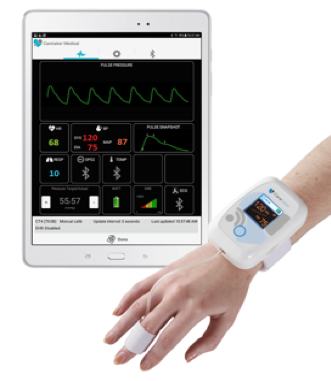 The wearable Caretaker4® monitor enables uninterrupted wire-free and electrode-free real-time vital signs monitoring throughout the full continuum of care, from clinic and hospital, to patient transport, and home monitoring after discharge. Using a comfortable, low-pressure, disposable finger cuff, Caretaker’s patented Pulse Decomposition Analysis technology non-invasively measures continuous Beat-by-Beat blood pressure, arterial pressure waveforms, Heart Rate and Respiration Rate along with other hemodynamic parameters for wireless display on the Remote Caretaker Display App, Secure Web Portal or other monitors.